Kids love to play on the S.S. Ponderosa. Visiting kids naturally gravitate to it. 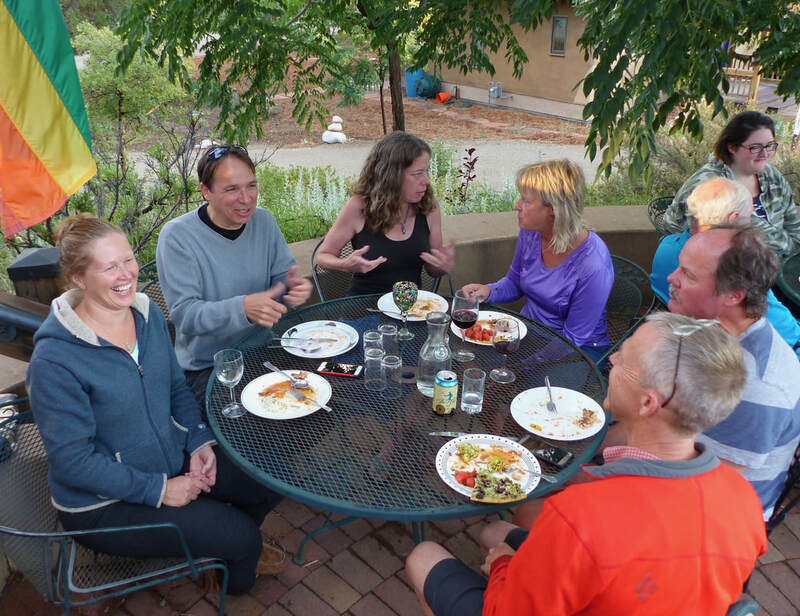 Come visit Heartwood and experience cohousing firsthand. We welcome anyone who would like to learn more about Heartwood Cohousing. 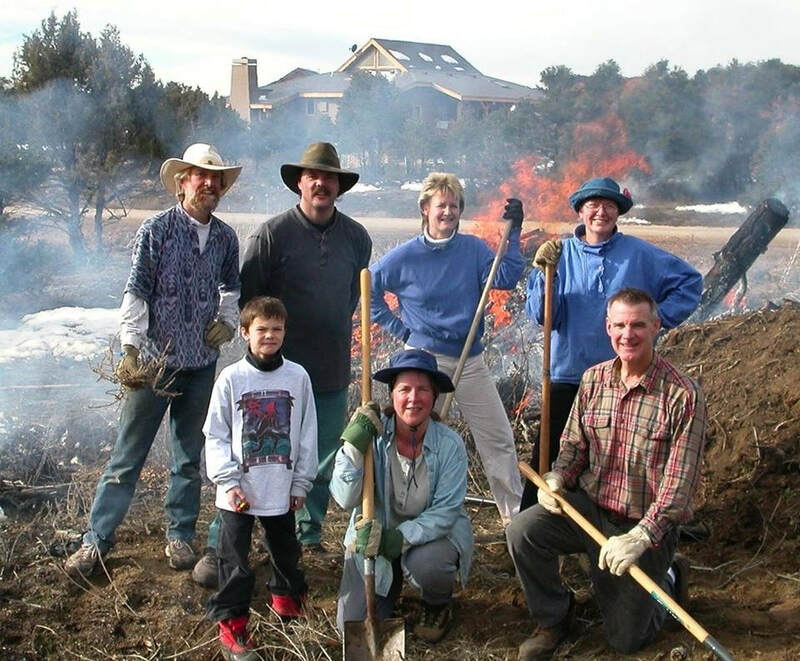 There are many different activities for you to participate in: community meals; social events; Community Meetings, impromptu ping pong or foosball games in the rec room; hikes on our 361 acres of land; work parties; horseback riding; and spontaneous social gatherings of all kinds. Spending a few days at Heartwood is an excellent preview into community life. We have two fully furnished guest bedrooms with a full bathroom in our Common House that we would be happy to reserve for you (recommended donation is $30 per guest bedroom per night). Please be aware that on rare occasions the guest rooms may be noisy, depending on the activities going on in the Common House during your stay. There’s a good article at The Cohousing Association website called “Making the Most of Your Cohousing Visits”. You might want to check that out. ​To make a guest room reservation or for more information about Heartwood, contact our Membership team. To get Membership team contact info, you'll need to click on the GET IN TOUCH button (at the bottom of each webpage). If you've already signed up to receive information through the GET IN TOUCH button, then just respond to one of the emails you received from us. The Membership team will help you plan your visit, including checking on guest room availability, signing you up for Common Meals, informing you about various community gatherings that may be happening during your visit, and introducing you to other community members. Common Meals occur every Tuesday and Wednesday at 6:30 (reservations required). Friday Happy Hour and Potluck happen at 6:00 and 7:00, respectively, during the summer and at 5:30 and 6:30 during the rest of the year. Bring a dish to share and BYOB if you'd like. Community Meetings (where we work on community topics using the consensus process) are scheduled as needed for first and third Mondays of the month from 7pm to 9pm. Meeting of the Hearts (where we get together for personal sharing) is scheduled on the second Monday of the month from 7pm to about 9pm. Work Parties occur on the third Saturday of the month from 9am until about 1pm (Sometimes we get started at 8am in the summer to work while it's still cool.) They are followed by a lunch for the workers at the Common House. * Wisdom Circle meets weekly on Saturday mornings at 7am. Sometimes these events are canceled and there are often other events happening, so make sure to check in with someone here before showing up. You can also check our online calendar to see what events might be scheduled when you're thinking to visit. A community work party is a great way to get to know the community while having some fun and making a contribution. We have community work parties on the 3rd Saturday of each month at 9am. Upon scheduling a visit with our Membership team, you will be assigned a Heartwood host and given their contact information. We encourage you to contact your host well before your visit so they can sign you up for Common Meals if you plan to attend and help you make connections with other members with whom you may share common interests. Once you arrive, your host will be available to greet you, get you settled into your guest room if you are staying overnight, give you a tour, and answer your questions about Heartwood. Being clear about your intentions for your visit to Heartwood will help your host tailor your visit to meet your needs. Because each of our Heartwood hosts volunteers time in the midst of their otherwise busy lives to help you get the most out of your visit, advance notice of at least a week is optimal. In any case, please contact your host as soon as you are able in order to arrange the details of your visit in a way that will work for both you and your host. On the day of your arrival, be respectful of the scheduling needs of your host by being on time. If you will be late or decide to cancel your visit, please contact your host as soon as possible. Please provide your own transportation to and from Heartwood and plan for your own eating needs other than the scheduled Community Meals. You are welcome to use the Common House kitchen and store food in the refrigerator. Before your visit, we encourage you to share your bio with your host or the Membership team so they can share it with the community. The bio really helps us get to know you just a bit before you arrive and gives those of us who may share common interests with you a better chance to make a connection with you. If you have questions prior to your visit and/or need directions for how to get here, please contact your host.